A few weeks back, I rented a chain-saw from the store to cut a tree. Along with the chain-saw came the ear protection mufflers. On inquiry with the store man, he said that it was mandatory that the ear mufflers be issued with the equipment whose noise levels were higher than the prescribed limit, but it is up to the user to use it or not. My mind raced back to my young officer days in the Indian Army. It was considered not manly enough to wear the ear plugs while firing the heavy caliber guns. As usual, after every firing practice session, one heard a thousand bees buzzing in the ears for the next few days. We all got used to this sound as we got used to the firing, without realising that we were getting into a world of Noise Induced Hearing Loss. The effects of it still continue and I have a hard time listening to whispers or low noises. Recently I called up an old friend in India and he must have been on the road, I could make out from the ear piercing horn sounds of horns of the vehicles coming through my ears. A sound I missed for the good. While driving our SUV, this SUV has been with us for the past seven years, our 14 year old son wanted to know where the horn was and how it sounded. I tried to blow the horn and pressed very hard in the middle of the steering wheel and nothing was heard. On reaching home, I pressed real hard applying all the force my body could place and the horn made a feeble noise, when compared to the screeching noises I heard over the phone. I now realised that I had never used the horn in my seven years of Canadian driving and may be that the springs in the center of the steering wheel might have been jammed. My mind went back to an article which appeared a few years ago in a newspaper here by an old man who had been to Thiruvanathapuram, Kerala, as a medical tourist for a knee replacement surgery. He describes his taxi ride from the airport to the hospital, a 20 km drive which took an hour, with the driver honking twice as many times as what he had done in fifty years of driving in Canada. Out here in North America, honking is considered indecent. It is done to alert some erring driver who has done some action that might have lead to an accident and you really want to abuse him with all your might. Else its only to attract the other driver’s attention to some thing serious like a not fully closed car door, deflated tyre etc which may lead to a fatality. While driving in India, one always honked, required on not, or may be that was the only way to get ahead in the confusion that existed on our roads. For some it was a practice set out by the driving instructors in driving schools. 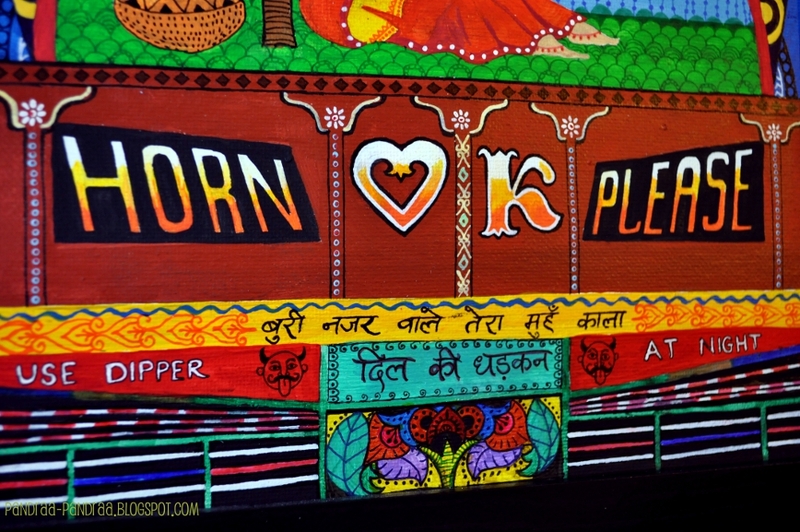 Can you for once imagine the noise pollution being created by the honking of the horn? May be its pretty irritating for me here as I have not been used to hearing this high pitched noise out here. The rules that lay down the pitch, tone and volume of the horns may be same in India keeping with the world standards, as most car manufacturers provide you with a ‘weak’ horn and the noisy ones are add-ons. May be in India to drive, the shrillness and volume of the horn may depict the size of your vehicle. That’s why the trucks have their horns sounding like an elephant trumpet. Air-horns even though illegal is fitted on most of the buses and trucks in India. These shrill horns posed a direct threat to road safety as they embolden drivers to drive more rashly and negligently. Road rage incidents go up as it gives drivers a false self-confidence as they believe they can shove through the traffic and scare away pedestrians. Many bus and truck drivers use it as an effective tool to clear the road. World Health Organisation in its report has stated that prolonged or excessive exposure to noise, whether in the community or at work, can cause serious permanent medical conditions like hypertension and ischemic heart disease. Noise can adversely affect performance, for instance reading, attentiveness, problem solving and memory. Use of air horn may cause severe physiological and psychological impacts on the pedestrians: Deafness is the last stop of noise and can damage the eardrum. The Indian Central Motor Vehicles Rules, 1989 specifies that all vehicles can be fitted with an electric horn or other devices, specified by the Bureau of Indian Standards for use by the driver of the vehicle and capable of giving audible and sufficient warning of the approach or position of the vehicle. The rules further specifies that no motor vehicle shall be fitted with any multi-toned horn or with any other sound-producing device giving an unduly harsh, shrill, loud or alarming noise except ambulance or fire-fighting or police vehicles. These rules are often broken and the police merely hear these shrill horns, many not realising the damage it has done to them, that they are welcome into my world of Noise Induced Hearing Loss. May be that we in India are pretty used to this honking and it may be very difficult to drive on the roads, shared by hawkers, cycles, animals, pedestrians etc with all the potholes and with the density of traffic, without honking. At least you can try and limit the number of honks. If everyone can reduce one honk a day, may be we will achieve less noise pollution on our roads in India.